Does your youth athlete want to move better, be stronger, get faster, gain muscle and become a fighting force on the field? If you answered yes then you have found your solution! Whether your athlete wants to get on that select team in town, make the varsity team in high school or get that college scholarship, this is the place for them. At Progressive Performance, we use a science based approach to improving performance, focusing on what works, and not just what is trendy. Progressive Performance is about getting strong! Strength training will give your youth athlete a bigger engine so they can produce more force, more power and reduce the risk of injury by just having a stronger body. Why is this good for sports performance? These are the ways the human body moves and expresses power and strength. A skills coach can only do so much when it comes to overloading the system and making the athlete more forceful. That is where we come in. This is good for a majority of sports: soccer, volleyball, football, basketball, softball, track and field, gymnastics, wrestling, baseball, hockey, lacrosse, tennis and even cross country and swimming. 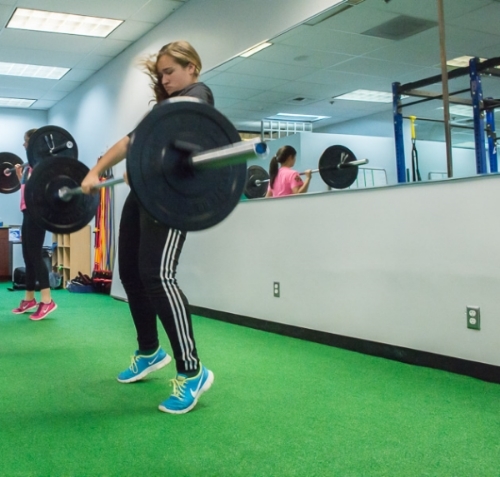 At Progressive Performance we guarantee your athlete will receive better results than any other sports performance program in the Woodinville area. With our small class size and highly educated staff, your child’s individual needs will be addressed in an even more detailed manner than is possible with larger class formats. With our movement assessment system, dysfunctional movement patterns and performance deficits will be addressed from day one and worked into a long term plan for success. We start every new athlete with a FREE Strength and Power evaluation to see where they stand, where we need to start and what needs to be worked on. Sports performance programming is for athletes from as young as 12 years old to 17 years old*. Programs for this group are tailored to where the athlete is in their development and maturity. All children are welcome to participate in Sports Performance classes, not just athletes, because who knows? Maybe lifting weights will become their sport. Strength training at a young age also helps build the life-long healthy habit of exercise into adulthood. Sports Performance classes are limited to 6 participants and are currently held on Monday - Thursday at 4pm. *Children as young as 8 years old will be accepted on a case by case basis, depending on maturity, ability to take instruction and respect authority. Apply here for your FREE Strength and Power Evaluation. Thank you for your interest in the Sports Performance Program. A coach will contact you in the next 24 hours.